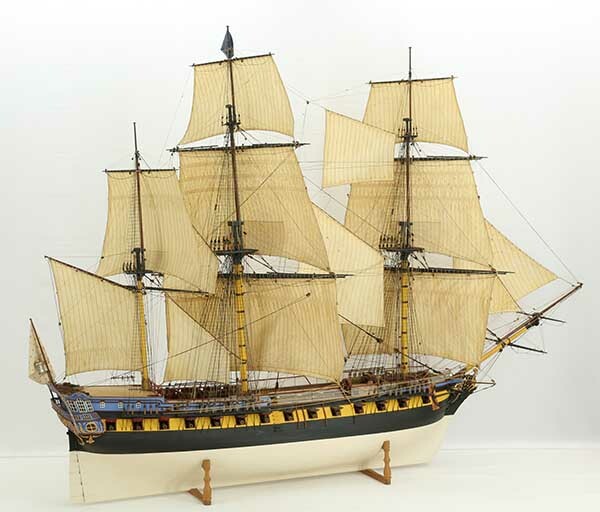 Amiral Paris cited the plans of the 40 gun frigate shown here in his collections (Amiral Paris, Souvenirs de la marine. Collections de plans ou dessins de navires et de bateaux anciens ou modernes) as "No. 260, emménagements de la frégate de 40 canons La Renommée". Those plans were based on the drawings of one of Chapman's frigates (Frederik Henrik af Chapman, Architectura Navalis Mercatoria, plate XXXI and XXXII, Stockholm 1768). Boudriot and Berti in their work conclude that Amiral Paris made a mistake when claiming that his drawings represented the frigate La Renommée, built in 1767 (Jean Boudriot, Hubert Berti, The History of the French Frigate, p. 130 - 136). However, in any case Amiral Paris' plans showed a fine example of elegant 18th century ship design. The model was built to the plans of Amiral Paris and Chapman. It is a true masterpiece, clearly showing the elegant forms of the original ship design. Hull and rigging are worked out in very detail. The ship model is 1 : 50 scale. Length is 142 cm, width 48 cm, height 108 cm. The sails were set like the ship being on starboard tack in wind abeam.